Ummm, no means no, Captain Bluesuit! Love them jodhpurs. I think I’ll get my boyfriend in a pair for Halloween. Now to figure the rest of his costume. 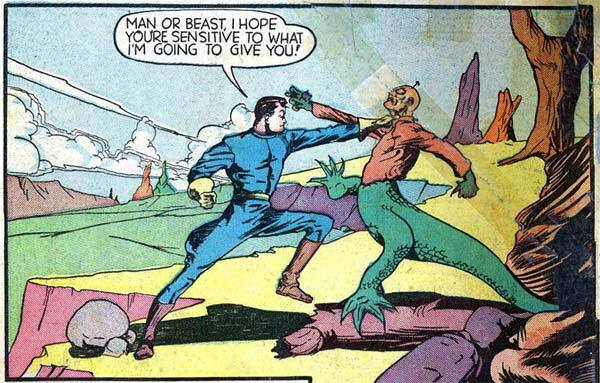 I just want to know why the guy in blue is beating up on the Legion’s Chameleon Boy. Did Rob Liefelds grandfather make this? Look at the guy’s leg! And face! He looks ridiculous! I…I can’t even grasp what’s going on….were are they? Rainbow planet? Green, blue and red rocks? I think the colorist was tripping. He’s clearly got a little Captain in him…now we just need to determine what his Captain name is. Those aren’t jodhpurs. That gecko think laid its eggs under his skin. Am I the only one disturbed that the alien guy on the right looks frighteningly similar to Aquaman?